Lighthouse, Eilean Musdile and Tom na Faire, Lismore. Oblique aerial photograph taken facing north-east. This image has been produced from a print. Lismore, Eilean Musdile, Lighthouse. General view from South-East. 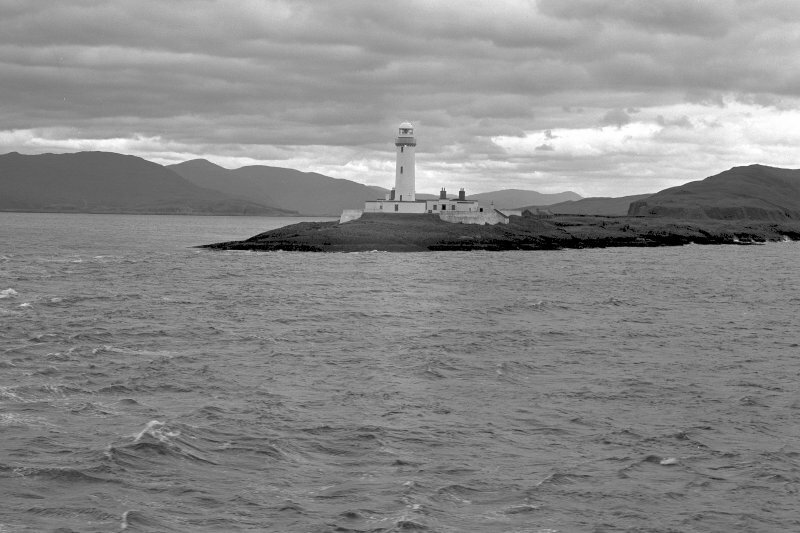 Lismore, Eilean Musdile, Lighthouse. View of keepers' houses from South-West. 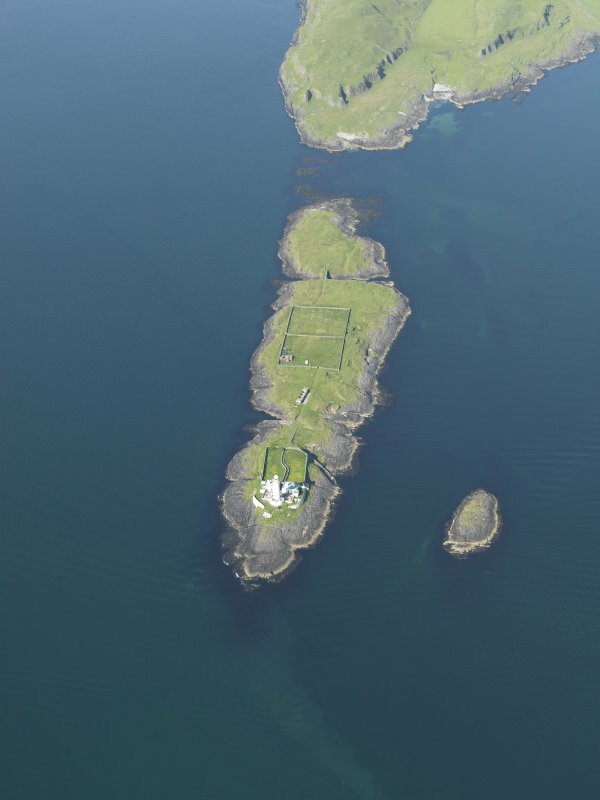 General oblique aerial view of Eilean Musdile and the Lismore lighthouse, taken from the SSE. 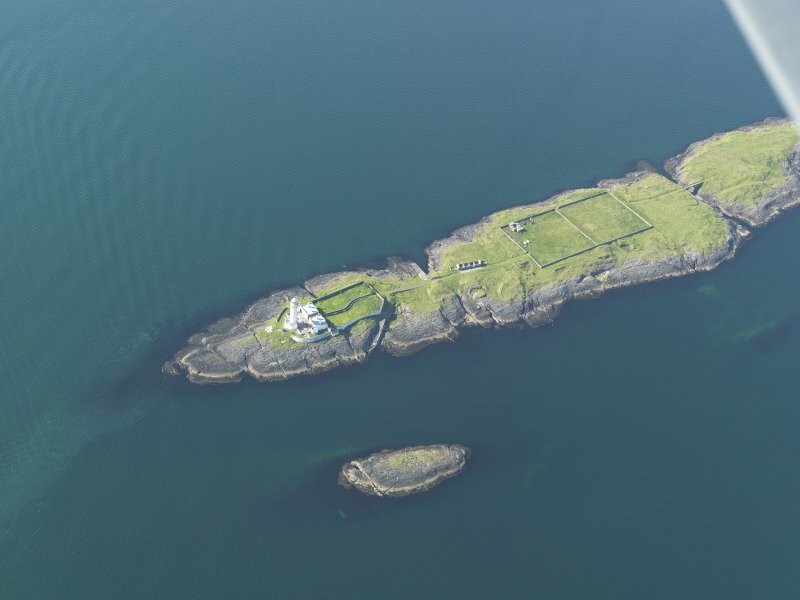 General oblique aerial view of Eilean Musdile and the Lismore lighthouse, taken from the SSW. Lismore, Eilean Musdile, Lighthouse. 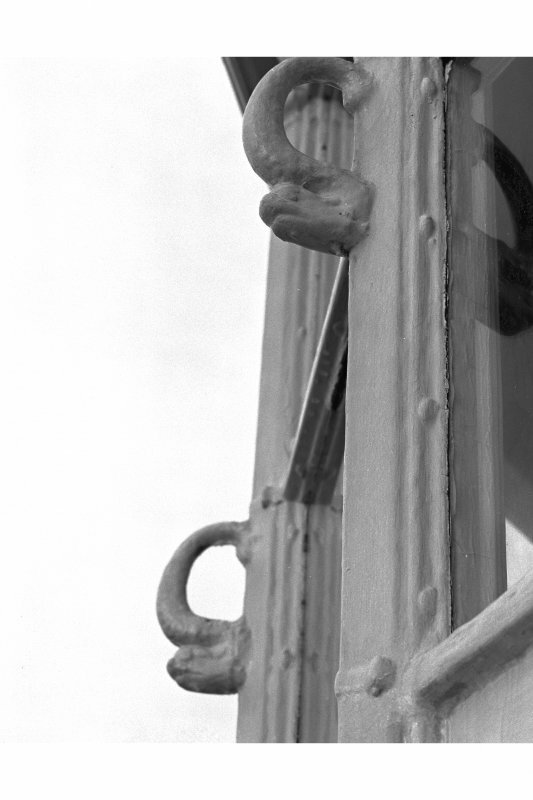 Detail of lantern showing dolphin handgrips. 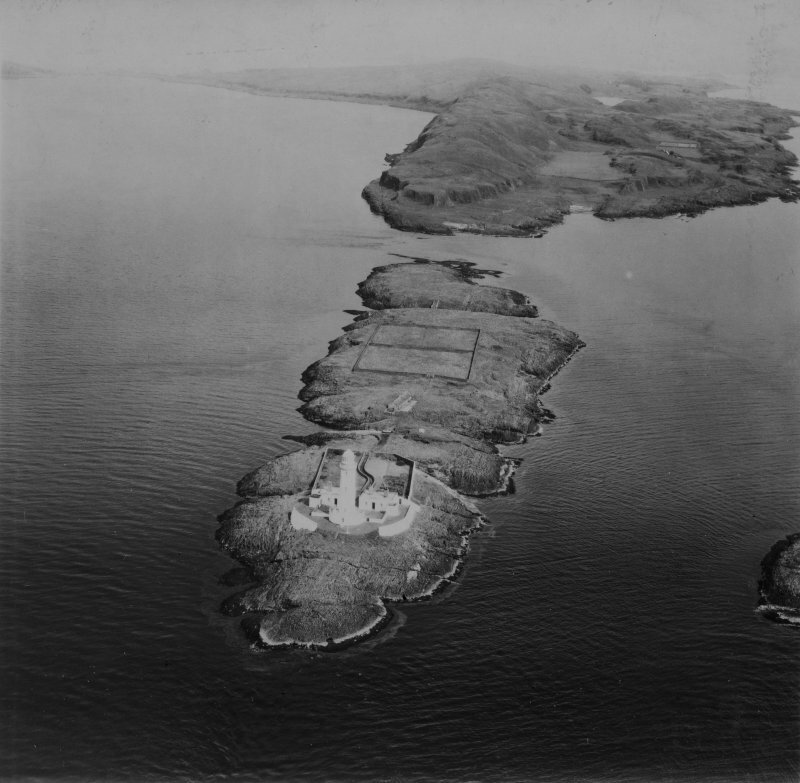 General oblique aerial view of Eilean Musdile and the Lismore lighthouse, taken from the SW.
Lismore, Eilean Musdile, Lighthouse. Detail of railings. Lismore, Eilean Musdile, Lighthouse. 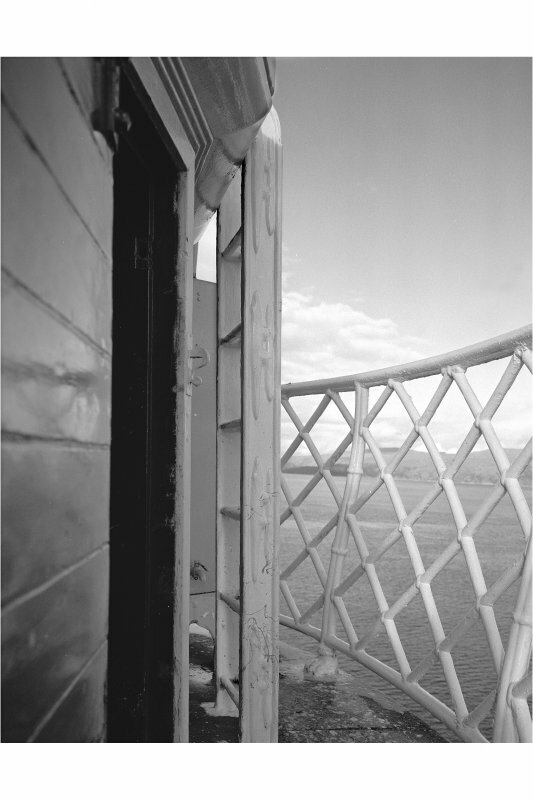 View of lantern interior showing decorative cast iron panel work. Lismore, Eilean Musdile, Lighthouse. General view from South-West. For standing stone (apparently destroyed or removed during lighthouse construction), see NM73NE 4. 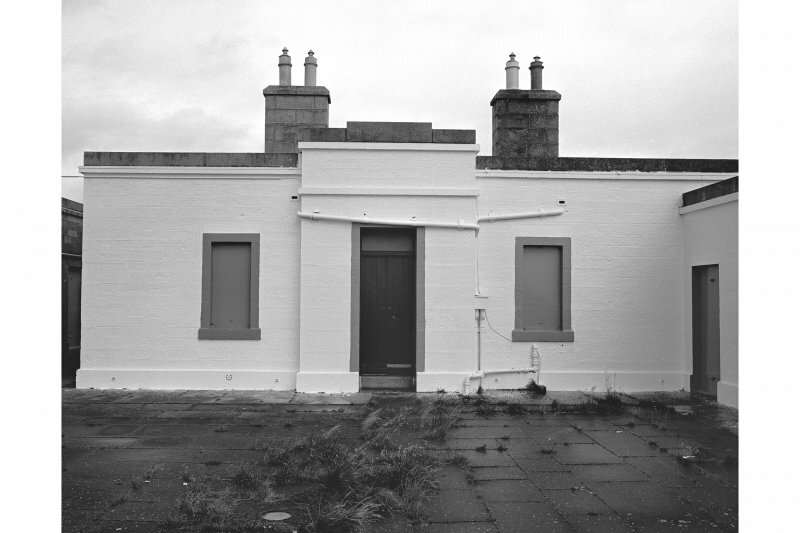 Restoration of south keeper's cottage by Shauna Cameron 1999-2000. (Location cited as NM 778 351). Lighthouse, Eilean Musdile, erected 1833, engineer Robert Stevenson. A tapering circular tower, with cast-iron square-paned lantern and corbelled walk-way with cast-iron lattice railing. The tower rises from a semicircular base. The single-storey range of keepers' houses, now disused, is in a simplified form of the flat-roofed 'Egyptian' style. The gorge that bisects the small island is spanned by a nicely finished rubble segmental arch. This tower lighthouse is situated at the SW end of Eilean Musdile, a projection to the SW of the island of Lismore, from where it guards and defines the ESE entrance into the Sound of Mull. It was established in 1833, being built by Robert Stevenson with James Smith of Inverness as the contractor. 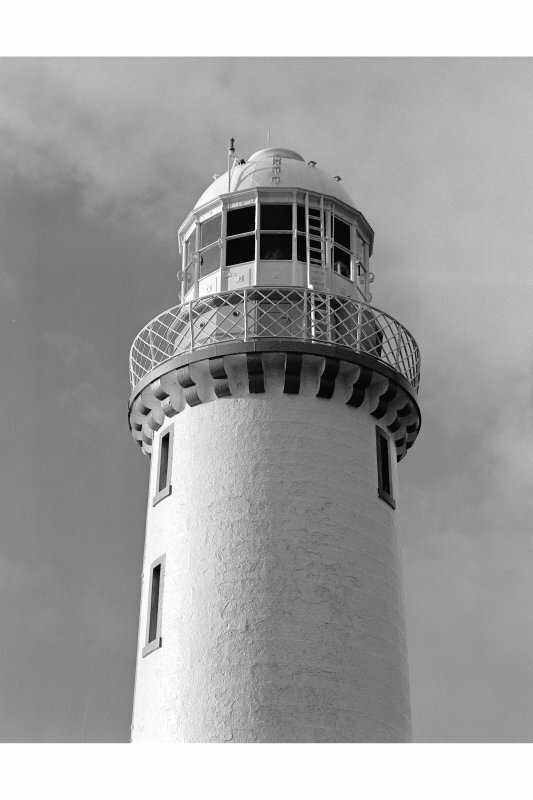 It was left (after 1910) as one of the two remaining purely catoptric lights in NLB service, being automated (as a major automatic light) in 1965. Information from RCAHMS (RJCM), 29 April 2008. 357. Lighthouse, Eilean Musdile, Lismore. This lighthouse (Pls. 107-9) was erected in 1833 at a cost of £11,230 by the Inverness contractor, James Smith, under the supervision of Robert Stevenson, engineer at the Commissioners of Northern Lights (en.1). 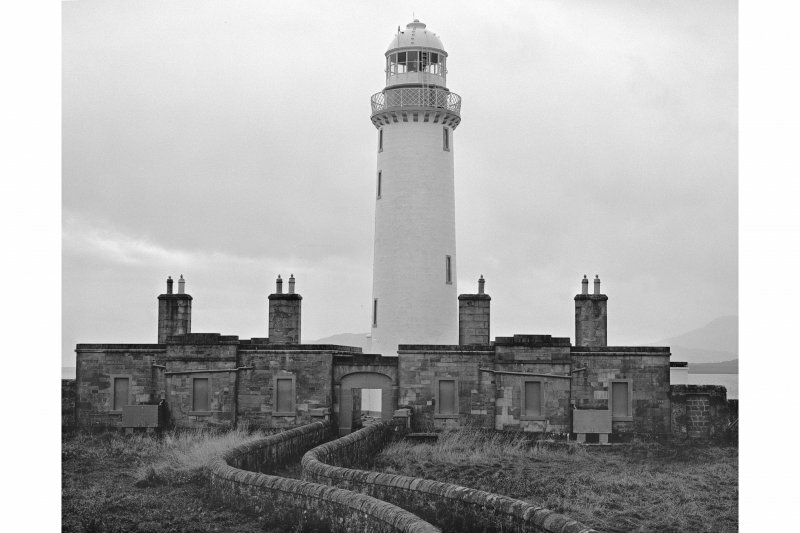 It comprises a lighthouse-tower and a pair of dwelling-houses symmetrically disposed about a small oblong courtyard. The tower has a diameter of 5'8 m at base over walls 1'4 min thickness, and rises to a height of 19.6 m at the corbelled parapet-walk, the lantern (Pl. 110A) being 31'4 m above the high-water level of spring tides (en.2). 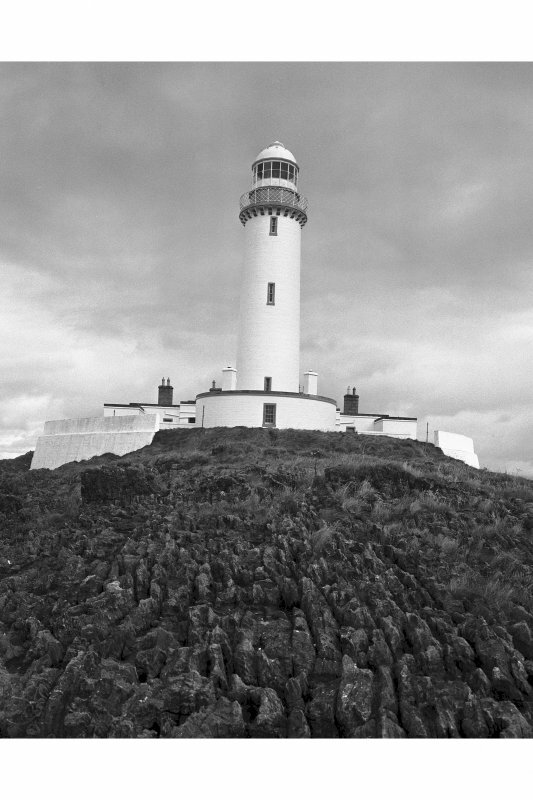 The masonry is of coursed lime-washed rubble, with painted dressings of freestone; stone for the construction of the lighthouse is said to have been quarried at Loch Aline (en.3). The parapet-walk (Pl. 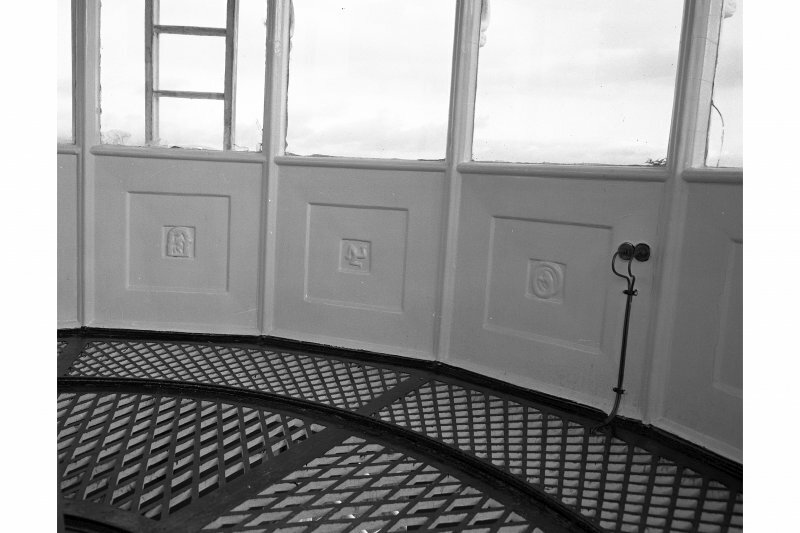 110B) has a lozenge-patterned hand-rail of cast iron, within which there rises the cast iron superstructure of the light-room, pierced by two rows of square glass panes. The glazing-bars incorporate cast-iron hand-grips, fashioned in the form of dolphins, while the base and cornice of the superstructure are decorated with panels of the same material which display various nautical and heraldic insignia (Pl. 110C, D). All these details seem to belong to the original period of construction, but the reflector-mechanism has been renewed. The keeper's houses (Pl. 110E) are plain single-storeyed buildings with flat roofs surmounted by prominent chimney-stacks; the central bays are advanced. The coursed sandstone-rubble masonry is exposed externally, but lime-washed on the courtyard side. The courtyard entrance (Pl. 110G), which is centrally placed, comprises a lintelled doorway set within a flat-arched recess whose blocking-course echoes that of the flanking houses. 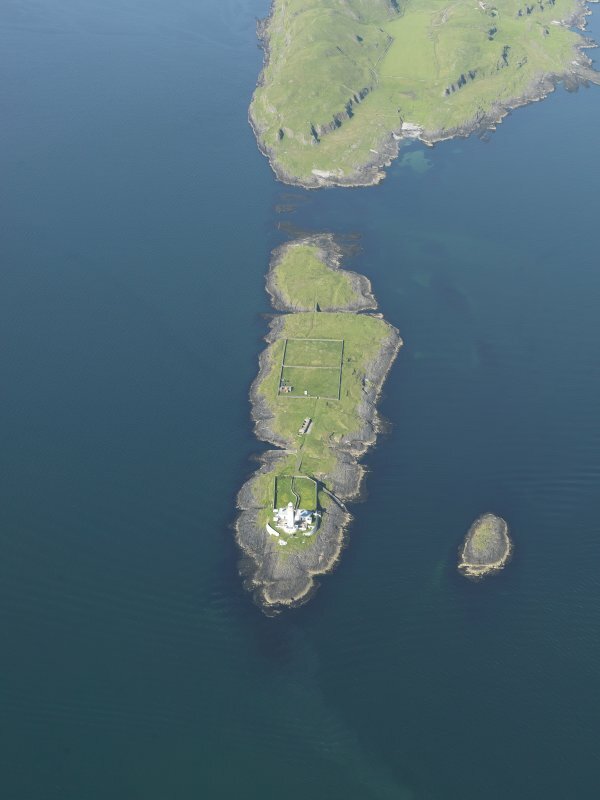 In front of the entrance there is a walled garden traversed by a sinuous path leading to an outer gateway, beyond which there are two slipways, one on each side of the island (en.4). 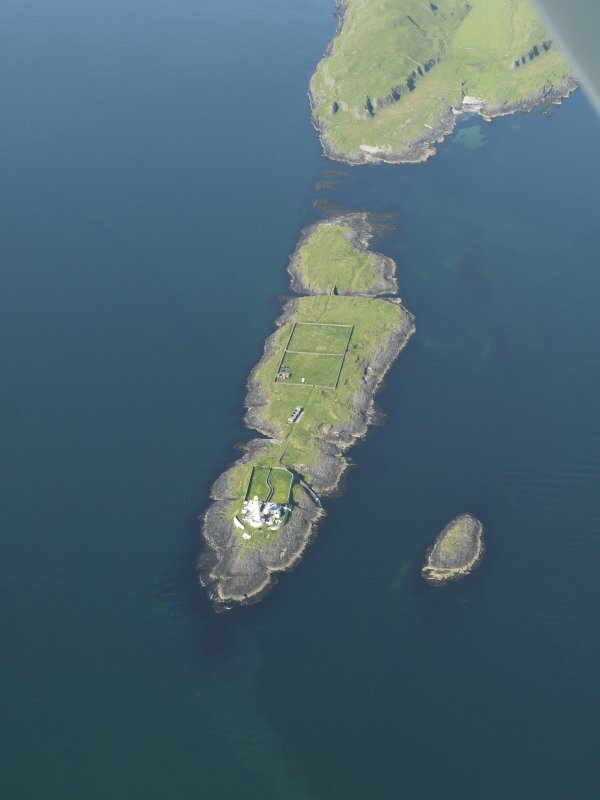 It was originally proposed to improve communication by the construction of a roadway and bridges linking Eilean Musdile with the island of Lismore, but the scheme was abandoned following the completion of a segmental-arched bridge (Pl. IIOF) spanning the gorge that bisects Eilean Musdile itself. En.1: 'Report of the Commissioners appointed to inquire into the condition and management of Lights, Buoys and Beacons...', Parliamentary Papers, 1861, xxv, vol. ii, 177. En.3: Gaskell, P, Morvern Transformed (1968), 171. En.4: As first planned the keepers' houses were semi-detached and there was no direct access from the garden to the courtyard (Contract-drawings, dated 1829, in the possession of the Northern Lighthouse Board).